I don't remember when was the last time a new MAC brush interested me enough to go check it out, not to mention actually buy it. But everything about MAC 159 called to me: the size, shape, and the functionality. 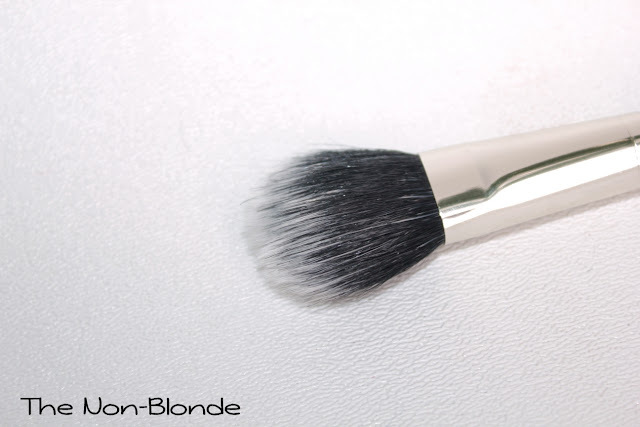 It's a duo fiber brush, meaning made of both natural goat hair and synthetic bristles. The brush head is shaped as a paddle that's chiseled and tapered towards the rounded edge, with the synthetic hair hanging about 3/4 inch further than the natural ones. 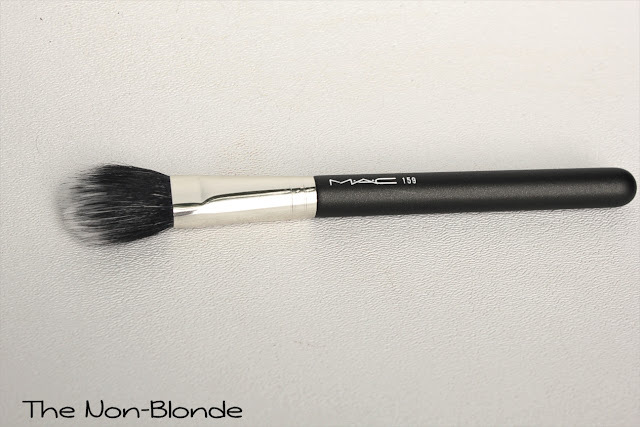 MAC 159 was created for use with blush, highighter and contour powders. Because of the difference in hair lenght, duo fiber brushes scoop less product than flat-top brushes, making them ideal for super pigmented blushes. They also ensure that you don't get an overload of highlighter on your face (you can always build the intensity). 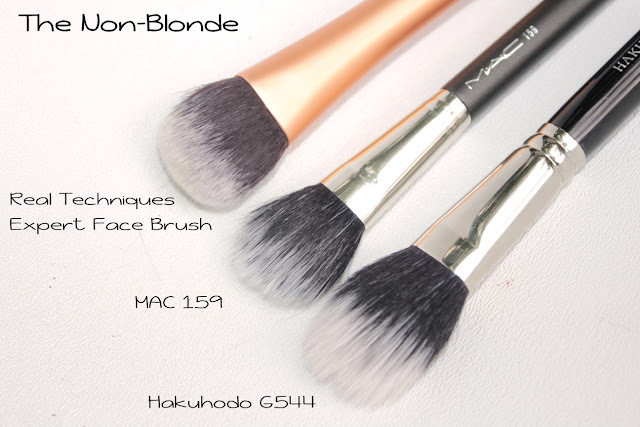 While MAC tells us that the 159 is meant for use with powder products, experience shows that it's also excellent for liquid and creams, much like its distant cousin, Hakuhodo G544. Obviously, MAC 159 is smaller and shorter than Hakuhodo G544. The latter was designed mostly for foundation (Hakuhodo also offers a smaller version, G545, which I don't have. Yet). I was thinking that MAC 159 is far too small for foundation, but then I realized that it's actually close in size to Real Techniques Expert Face Brush, an excellent tool for applying one's base. However, there are two significant differences: the Real Techniques brush is all synthetics (it's dyed to look like a duo fiber, but it isn't), and it's much (much!) denser, hence the great buffing action you get from it. MAC 159 is softer, sparser (in a good way, for applying color), and has a lot more give for blending the blush or highlighter. It's also adequate for contour, though I usually prefer more directional shapes for this purpose. My MAC 159 has lost some of its natural hairs after the first couple of washing sessions, but has settled since. It also bleeds a little when I give it a quick soak. The brush performs well and is versatile enough to see quite a bit of use. It's a very good tool that I enjoy having in my collection. The $35 price tag of this brush when compared to Hakuhodo raises an eyebrow or two: the larger G544 is now $33 while G545 (almost identical measurements at 30mm x9.5mm x16mm) is $24. I guess that's the price of easy access, but it's something to keep in mind. Bottom Line: worth the space in the brush holder. MAC 159 Duo Fiber Brush ($35) is available at the counters, MAC stores and maccosmetics.com. I have the Hakuhodo G544 and get a lot of use out of it, but when I was looking for something smaller, a bit more directional, the MAC 159 caught my eye. Let me be up front and say that I am not a fan of MAC brushes. I find them mediocre at best and that they wear out quickly, but I must say I've been quite pleased with the 159. I bought it at the same time that I bought Laura Mercier's new baked highlighter and it is a match made in heaven. 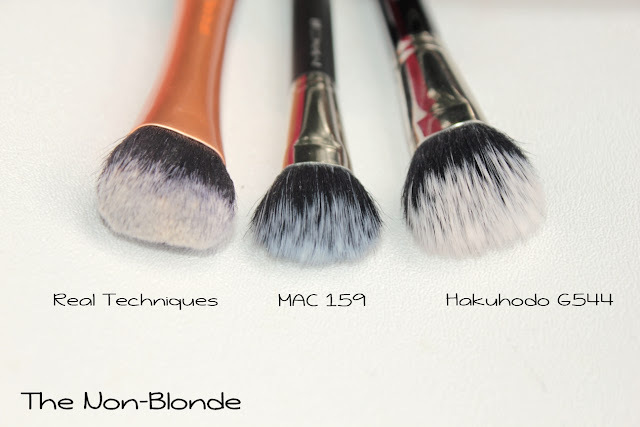 Please,can you tell what is the measurements of MAC 159 BRUSH? !